As oil prices rise, investors are jumping into oil stocks. We can tell by the number of shares of the SPDR S&P Oil & Gas Exploration & Production ETF (NYSE: XOP). This exchange-traded fund (ETF) tracks a basket of U.S. energy companies. The value of the ETF rises and falls on the value of the underlying stocks. As investors buy XOP, fund managers simply create more shares and buy more stock in the underlying companies. As you can see, XOP shares are growing steadily. 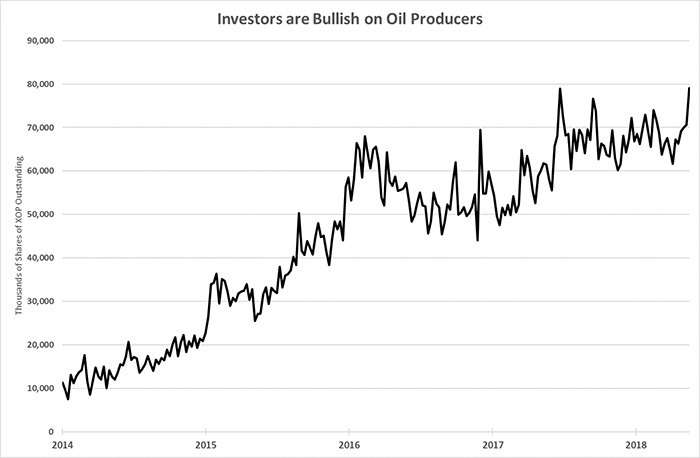 That tells us the average investor is excited about oil production again. That’s due to the rising oil price. As we discussed in these pages many times over the last few months, oil prices are rising. There is a solid uptrend in place. However, we do not own any oil-producing companies in the Real Wealth Strategist newsletter right now. And we don’t plan to add any U.S. shale producers soon. The reason is simple: They don’t earn the full oil price. Most of the mid-tier oil companies must “hedge” their oil prices. That means they find a buyer and lock in a price for some or all their future production. The hedges usually last a quarter or six months of the year. The bulk of the hedges set by shale producers in the Permian Basin of West Texas are low compared to today’s oil price. The Permian Basin is the single largest shale play in the U.S. today. Oil production there is at an all-time high. There is so much oil that it’s hard to get it to market. All the pipelines are full. As you can see, those prices are all well below the current spot price of $72.20 per barrel. That’s going to be a letdown for some investors who think oil producers earn the spot price. That’s why we aren’t eager to buy U.S. shale producers yet. While those companies may not get the benefit from the full oil price, they are working hard right now. All those companies are spending lots of money on drilling and completing wells. That’s why we are still bullish on the service companies that make up the VanEck Vectors Oil Services ETF (NYSE: OIH).